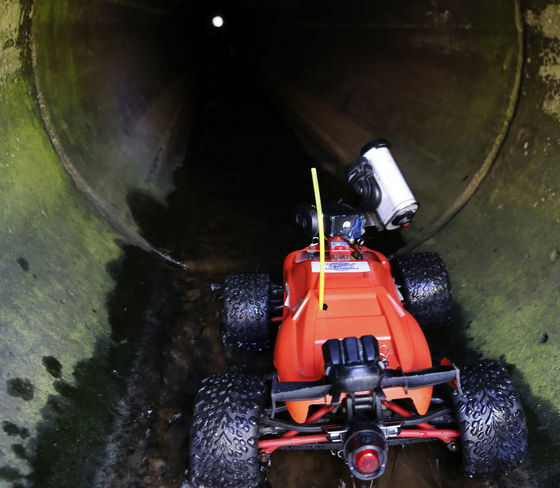 MnDOT District 6 has developed the Hydraulic Inspection Vehicle Explorer (HIVE), a radio-controlled car that takes lights and a camera into culverts and transmits inspection data wirelessly to a tablet. Each vehicle costs roughly $1,500. Every MnDOT district now has a HIVE, which has been used to inspect hundreds of pipes and is already saving money. One visual inspection of a culvert showed damage to the ends of a pipe that typically would result in a full replacement cost of about $45,000. However, HIVE video footage from within the pipe showed the damage was limited to just 12 feet near the end. Instead of replacing the entire pipe, MnDOT workers fixed the problem for $1,000, resulting in a $44,000 savings. The HIVE has received the 2016 Governor’s Better Government Award and was recently selected as one of the nation’s top research projects. A July 26 webinar will review the HIVE and other enhanced culvert inspection technologies. Find more information at mndot.gov/research/projects/hive/hive.html. 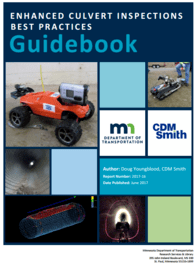 The HIVE is just one of the advanced inspection technologies included in MnDOT’s new Enhanced Culvert Inspections Best Practices Guidebook. BRIDGES & STRUCTURES — Since 2008, the I-35W St. Anthony Falls Bridge has operated as a “smart bridge,” with over 500 sensors that continuously provide data about the impact of traffic and weather on the concrete structure. To accurately analyze the data generated, researchers must isolate the effects of structural damage from normal cycles of expansion and contraction. Investigators developed a method for creating a “vibration fingerprint”—a baseline of the bridge’s natural vibration that makes unexpected deviations more apparent. Data from this fingerprint will help MnDOT detect when a bridge needs repair and ultimately inform design improvements so that bridges better withstand stresses. BRIDGES & STRUCTURES — Local agencies with limited budgets are often unable to maintain all of their bridges. Removing bridges on low-use roads where alternative access is available for nearby residents could mitigate funding constraints. Officials are often reluctant to take this step, however, because stakeholders often disagree on the criteria for determining which bridges should be removed and how to manage the attendant public relations issues. The Local Road Research Board commissioned a survey of state departments of transportation (DOTs) on this topic, asking about the relationship between the DOT and the local government (for example, whether incentives are offered for bridge removal), whether local agencies maintain an inventory of candidates for removal and how bridges can be removed from the National Bridge Inventory. A Transportation Research Synthesis (TRS) is a short-term research project that summarizes research activity and current state of the practice. To view TRSs or request one to address your research need, visit mndot.gov/research/TRS.html. BRIDGES & STRUCTURES — Post-tensioned bridges, which are strengthened by running steel strands through the concrete members, are especially durable, but grout around the steel strands is needed to keep them from corroding. Grouting materials used in about 40 older Minnesota bridges often produced air voids that don’t completely cover the strands, which could lead to corrosion and may require repair. A two-phase research effort has produced techniques for evaluating these structures and guidelines for managing the process of soliciting and procuring engineering and construction services to repair them. TRAFFIC & SAFETY — Roundabouts are unquestionably safer than intersections with traffic signals or stop signs. But what’s the best way to configure signs, pavement markings, illumination and other treatments to get drivers to slow down enough to keep roundabouts safe? Research into existing practices provided information on the effectiveness of various treatments—including high-tech solutions like speed-activated, LED-enhanced warning signs—and a methodology for studying any given intersection to determine what will work best for that location. TRAFFIC & SAFETY — Because crashes at intersections are rare, collisions are not the best indicator of potential safety problems at these locations. Instead, investigators used the SMART-Signal system, which collects data at more than 100 intersections in the Twin Cities, to measure how often drivers run red lights, along with vehicle speeds and traffic volumes. They used this data to develop a formula to estimate with more than 83 percent accuracy how many daily traffic conflicts are likely to occur at each intersection. This kind of data is very useful for directing law enforcement efforts as well as adjustments to signal timing or intersection layout. 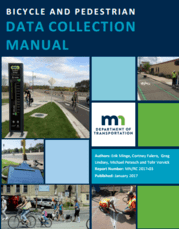 As part of an ongoing effort to institutionalize bicycle and pedestrian counting in Minnesota, MnDOT has published a new manual to help city, county, state and other transportation practitioners in their counting efforts. The Bicycle and Pedestrian Data Collection Manual provides guidance and methods for collecting bicycle and pedestrian traffic data. This introductory guide to nonmotorized traffic monitoring is designed to help local jurisdictions, nonprofit organizations and consultants design their own programs Several case studies are included to illustrate how bicycle and pedestrian traffic data can be used to support transportation planning and engineering. Where roads meet rivers, culverts can block fish and other aquatic organisms that can’t navigate changes in current, lighting or other factors. Researchers are working to establish a set of culvert design practices to help aquatic creatures get where they’re going. Researchers are experimenting with mobile light detection and ranging (LiDAR) using a sedan rigged with senors. They are collecting data that they hope leads to the creation of applications that can be useful to county highway departments and municipal public works departments. In the Sept./Oct issue of our bimonthly newsletter: Alternate route signage; guidance for flashing yellow arrows; automating bike and pedestrian traffic monitoring; changing travel patterns; upgrade to bike-route finding tool (“Cyclopath”); LiDAR demonstration; asphalt bond testing; limestone aggregate specifications; MnPASS pricing analysis; steel culvert design. The Federal Highway Administration (FHWA) recently released a video and a 44-page publication that document role research and technology play in meeting the demands of the nation’s highway system and contributing to improvements in safety, infrastructure and operations. Connect with MnDOT Research Services & Library on the web, Twitter, Facebook, LinkedIn, YouTube and via Crossroads, our joint blog with the Center for Transportation Studies. After a lifetime of overcoming obstacles, third-generation winemaker Vincent Negret is on the verge of fulfilling his dream as he prepares to open his winery — Negret Wine Company — in downtown Hudson on Thursday, Oct. 29. “It’s scary, but nice,” Negret said. The Hudson Area Chamber of Commerce & Tourism Bureau welcomed it’s newest member Audrey’s Canvas Parties. Artist and owner Audrey Martin has been developing her skills since childhood. Audrey provides art instruction for children and adults in group or one-on-on one sessions. Where in Hudson is That?